Quantum computing uses quantum mechanics to process enormous amounts of information at an unbelievably high rate of speed. It takes a few minutes to several hours for a quantum computer to solve a problem that a desktop computer would take years or decades to solve. Quantum computing is setting the stage for a new generation of supercomputers. These quantum computers are expected to outperform existing technology in areas such as modeling, logistics, trend analysis, cryptography, and artificial intelligence. The idea of quantum computing was first imagined in the early 1980s by Richard Feynman and Yuri Manin. Feynman and Manin believed that a quantum computer could simulate data in ways that a desktop computer could not. It wasn’t until the late 1990s that researchers built the first quantum computers. Quantum computing uses quantum mechanics such as superposition and entanglement to perform computations. Quantum mechanics is a branch of physics that studies things that are extremely small, isolated, or cold. The primary processing unit of quantum computing is quantum bits or qubits. Qubits are created in the quantum computer using the quantum mechanical properties of single atoms, sub-atomic particles, or superconducting electrical circuits. Qubits are similar to the bits used by desktop computers in that qubits can be in a 1 or 0 quantum state. Qubits differ in that they can also be in a superposition of the 1 and 0 states, meaning that qubits can represent both 1 and 0 at the same time. When qubits are in superposition, two quantum states are added together and result in another quantum state. Superposition means that multiple computations are processed simultaneously. So, two qubits can represent four numbers simultaneously. Regular computers process bits in only one of two possible states, 1 or 0, and computations are processed one at a time. Quantum computers also use entanglement to process qubits. When a qubit is entangled, it means that the state of that qubit depends on the state of another qubit so that one qubit reveals the state of its unobserved pair. Creating qubits is a difficult task. It takes a frozen environment to maintain a qubit for any length of time. The superconducting materials required to create a qubit must be cooled to absolute zero (about minus 272 Celsius). The qubits must also be shielded from background noise to reduce errors in the computation. The inside of a quantum computer looks like a fancy gold chandelier. And, yes, it is made with real gold. It’s a dilution refrigerator that’s used to cool the quantum chips so that the computer can create superpositions and entangle qubits without losing any of the information. The quantum computer makes these qubits from any material that displays quantum mechanical properties that can be controlled. Quantum computing projects create qubits in different ways such as looping superconducting wire, spinning electrons, and trapping ions or pulses of photons. These qubits only exist in the sub-freezing temperatures created in the dilution refrigerator. Quantum algorithms provide the ability to analyze the data and offer simulations based on the data. These algorithms are written in a quantum-focused programming language. Several quantum languages have been developed by researchers and technology companies. QISKit: The Quantum Information Software Kit from IBM is a full-stack library to write, simulate, and run quantum programs. Q#: The programming language included in the Microsoft Quantum Development Kit. The development kit includes a quantum simulator and algorithm libraries. Cirq: A quantum language developed by Google that uses a python library to write circuits and run these circuits in quantum computers and simulators. Forest: A developer environment created by Rigetti Computing that is used to write and run quantum programs. Real quantum computers have become available in just the last few years, and only a few large technology companies have a quantum computer. Some of these technology companies include Google, IBM, Intel, and Microsoft. These technology leaders are working with manufacturers, financial services firms, and biotech firms to solve a variety of problems. The availability of quantum computer services and the advancement in computing power gives researchers and scientists new tools to find solutions to problems that were previously impossible to solve. Quantum computing has reduced the amount of time and resources it takes to analyze incredible amounts of data, create simulations about that data, develop solutions, and create new technologies that fix problems. The aerospace industry is using quantum computing to investigate a better way to manage air traffic. Financial and investment firms hope to use quantum computing to analyze the risk and return of financial investments, optimize portfolio strategies, and settle financial transitions. Manufacturers are adopting quantum computing to improve their supply chains, create efficiencies in their manufacturing processes, and develop new products. Biotech firms are exploring ways to accelerate the discovery of new drugs. Does this mean that you’ll have a quantum computer soon? Some computer scientists are researching the possibility of simulating quantum computing on a desktop computer. While you wait for your quantum computer, there are several opportunities to experiment with quantum devices and simulators. Many of the world’s largest technology companies offer quantum services. These quantum services, when paired with desktop computers and systems, create an environment where quantum processing is used along with desktop computers to solve complex problems. IBM offers the IBM Q environment with access to several real quantum computers and simulations you can use through the cloud. Alibaba Cloud offers quantum computing cloud platform where you can run and test custom-built quantum codes. Microsoft offers a quantum development kit that includes the Q# programming language, quantum simulators, and development libraries of ready-to-use code. 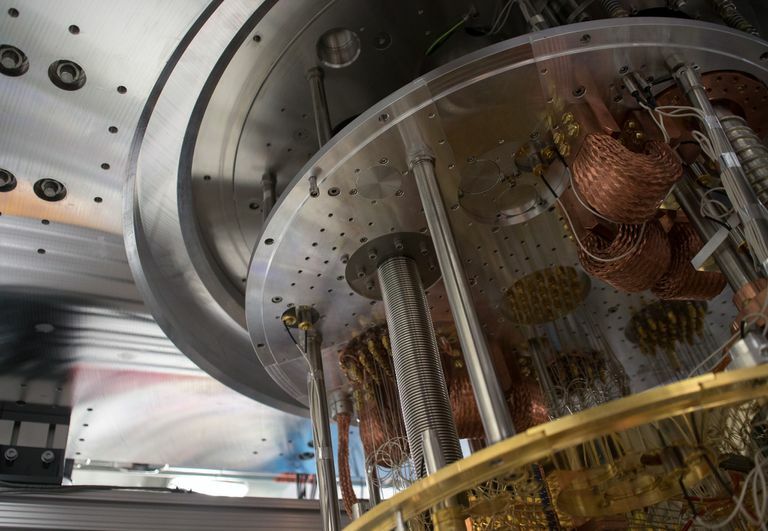 Rigetti has a quantum-first cloud platform that is currently in beta. Their platform is pre-configured with their Forest SDK. The dream is that quantum computers will give us the ability to solve problems that were previously thought to be too large and too complex to solve. The hope is that this technology will help us understand the environment and find cures for incurable diseases. Desktop computers don’t have the space to run these types of complex calculations and perform this incredible amount of data analysis. Quantum computing takes the largest of the giant big data collections and processes it in a fraction of the time of a desktop computer. Data that would take a desktop computer several years to process and analyze takes just a few days for a quantum computer. Quantum computing is still in its infancy, but it has the potential to solve the most complex world problems at the speed of light. It’s anybody’s guess as to how far quantum computing will grow and to the availability of quantum computers.